I used to work as a manager in an old English pub in Kent and a small studio flat above the pub came with the job. All sorts of things used to happen at night mostly which would wake me up. The window latches used to undo themselves, the doorbell used to chime when no one was at the door resulting in me removing the batteries. Items used to go missing. One summer I used to have two fans running to keep me cool during the night. One morning I woke up and they were both not running, but still in the 'on' position and never worked again. 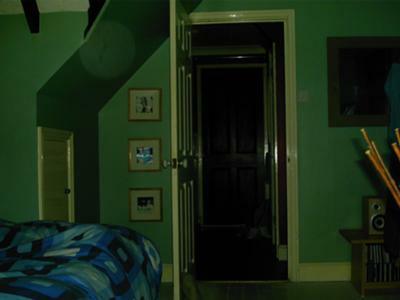 So I decided to take a few pics with a digital camera every time I was woken during the night. 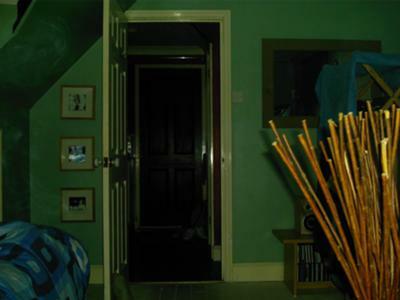 Apart from getting loads of orbs there is one pic that stands out. If you look to the left side of this pic you can see a large face at the top with similar small faces running down the side. 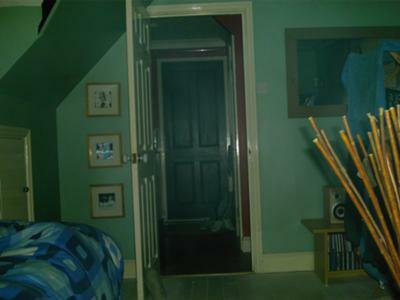 I did find out the old manager moved out of the flat due to seeing an angel-like ghost one night. I no longer live there. That's neat! (And yes, it does look like Rodney Dangerfield!) lol It seems to me, like there's something in the mirror too? I see the face. It does look like an old English man. All I'm seeing is cigarette smoke and a lens flare on the left side. Happens all the time in pics with friends while out at a club/bar. I see what you're saying, Ghost Coach. Didn't notice that before. I would like to say, I didn't mean to say it was definitely smoke. I have hundreds up pictures, and in pics I know to be smoke, they all have on thing in common, when you enlarge them, you can see the swirls the smoke makes when drifting in the air. Thanks for the supplemental photos. I have posted them above. I noticed the big dust orb in the top pic, and yes, I get those in my pics all the time - I noticed how similar in shape it is to the shape on the wall. I'm not convinced they're the same thing, though. Could part of that be reflection off of those pictures hanging on the wall. There is obviously a flash reflecting on the middle one, but, maybe it's not causing all of what we are seeing. I have recaptured and blown up, it is smoke. All though it dose look like mist under the main face in the pic I've uploaded,on the camera you can see after other faces,(not so clear here)I did take another three pics at the time from the same position and in these I got some kind of haze and an orb,I will try to upload the others, cheers for your comments Nathan. It looks like a creepy old man. Love it! Wow! I see the face. It almost looks like the reflection off something, but I can't tell what. What is more interesting to me is that below the big face, it appears to be a mist rather than more faces. It seems 3 dimensional, rather than just an image on the wall. Very interesting. Perhaps someone else can debunk or explain.